Meal Notes: This simple, healthy, zesty dish makes the perfect side for a busy weeknight. Try serving with Pan Broiled Steaks, Spanish Chicken and Tomatoes, or Chicken with Herb Roasted Tomatoes. Prep: Mince garlic. Zest lemon. Trim the ends off green beans. Place a colander in the sink. Fill a large bowl with ice and water. Blanch: Bring a large pot of salted water to boil. 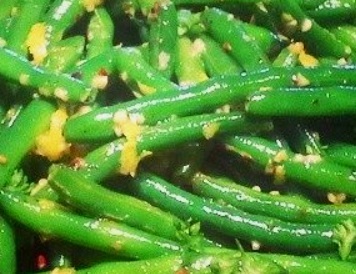 Blanch green beans by adding them to the boiling water, cooking until tender-crisp, about 2 minutes. Drain green beans in colander, then immediately dump into bowl of ice water to stop them from cooking. Fry: Heat a large skillet over medium heat. Add olive oil and butter. When butter melts, add garlic and red pepper flakes. Saute until fragrant, about 30 seconds. Add the green beans. Saute, coating in the garlic sauce for about 5 minutes.